Hyperions latest 5.5 firmware is bluetooth enabled. Anyone have any ideas how to connect a serial bluetooth module to the Hyperion EOS0615i duo3+ and EOS720i super duo 3? Thanks. All sorted with the help of Mr Mel. Thanks, great. Will use those on the page! Has anyone successfully installed a BT module in a 720i Super Duo 3? I am in the process of trying however when the charger is powered on I only get around 2vdc across between the USB case and the back pin on the temperature sensor port. I believe it needs to be at least 3.3vdc to power the BT Module. Also I am at a loss for locations to solder the Rx and Tx Wires. Never looked inside one of those. Burgerman wrote: Never looked inside one of those. Tx and Rx I dont know either. Not without seriously folowing the traces, from that square chip. Its the same chip on all the boards. But I really would need the board here, and some timer to figure out exactly what was what! 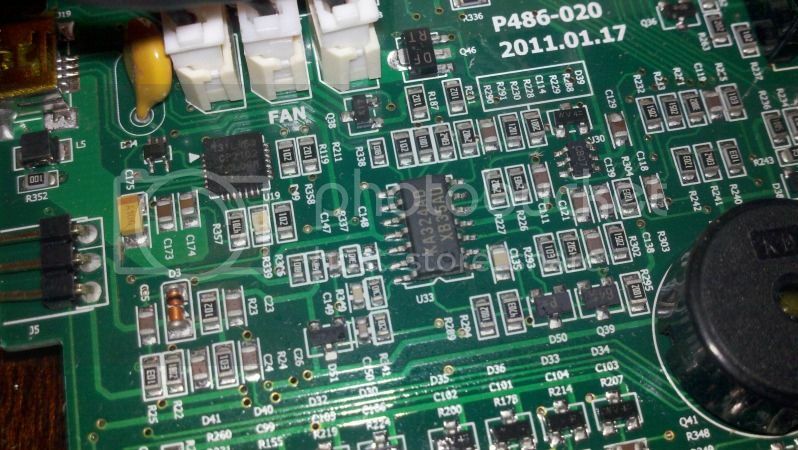 The component numbering system on the board is a little odd ..but you can see that the resistors under the word FAN are R211 and R119 .. exactly the same as the other pic. Look at the group of components to the right of R338 4 resistors 1 cap 2 resistors and a "diode" ..you'll see above the 3 leged "diode" that the grouping is printed. There is someone can make 720 super duo 3 working with the BT ? Can you give me the soldering image ? Dont think anyone here has one of those. We are all charging bigger batteries with more than 7 cells. Using the great tutorial on the main site I sorted out the connections for the super duo 3.. I am mobile currently and don't have anything to markup the picture of the SDUO3 in the thread but.... If you look at the 0730i in the tutorial picture as a reference, it's the same layout but the RX and TX locations are swapped... Everything else works as is..
615iduo3 is a different animal as far as component layout goes. If anyone has location of TX, RX I would greatly appreciate it. doh - scroll the photo John - now I see it is on the underside !!! how to pair or add hzperion as a device via bluetooth. what is the password. Thanks BM. That will save me buying one (bluetooth usb adapter). Also, sorry about the duplicated posts above. Sorry to hear BM say that it doesn't work. Not me, some have tested it on the RC Models Hyperion thread. Zhavener wrote: Has anyone successfully installed a BT module in a 720i Super Duo 3? I am in the process of trying however when the charger is powered on I only get around 2vdc across between the USB case and the back pin on the temperature sensor port. I believe it needs to be at least 3.3vdc to power the BT Module. Also I am at a loss for locations to solder the Rx and Tx Wires. I know that this is an old thread but it sounds like you have shorted both rx and tx resistors while soldering which may cause this voltage drop when you plug in the BT module. Has anyone tried to replace these two resistors? Whats the specs of these chip resistors? A friend of mine is doing this mod and got the module to power up but then did a bit of a mess soldering the rx tx resistors and touch each other which then causes the module not to power up anymore when plugged in as it only shows 2v now. Also, the EOS software doesnt detect the charger anymore from USB port after this. Is it a brick charger now or is there still chance of getting this to work? Get out your magnifying glass - MOST, but not all SMD resistors, especially in the larger physical sizes, will have values on them, using the standard 3-digit resistor code (2 digit value and a multiplier for the decimal place). It might be necessary to pull the part off and look at the underside if it was put on upside down. Wattage is essentially set by the physical package size, if you use the same size, that should be OK. Most chip resistors now use a 4-digit code, but you can easily find both the 3-digit and 4-digit schemes on Wikipedia. Unlike resistors, chip capacitors generally don't have their values marked. How hard it is to remove and replace an SMD component depends on how tightly the board is packed, and what tools you have available. With a small soldering iron, and a chisel tip modified to a kind of two-pronged fork, I can pretty reliably remove 0805 sized chips without damaging anything else if there's a bit of space. For smaller I think re-work would be very difficult without having a hot-air desoldering tool (which I don't have). Sometimes, when I know a chip is bad I destructively remove it by heating one pad and prying up with a tiny screwdriver. Sometimes damages a pad, but can usually patch that one way or another. I really do need to get a modern SMD soldering station, but I'm cheap. In general I find making SMD board far easier than making through-hole boards (and all I have for that is a cheap toaster oven, very fine solder that I flatten with pliers and cut into pieces, and some sticky flux). It's tedious to position everything, but then the reflow soldering is a snap. Repairs are another matter, however. I had the same problem, but I solved it. The reason is Hyperion changed the layout of this charger. The area for USB and the area the charger itself is separated with this optocoplers (https://www.fairchildsemi.com/datasheet ... DM8061.pdf). To get it working you have to use a separate power supply from extern USB or with a 5V fixed regulator. But you have really to supply Pin 1 from the USB so you get 3V on Pin 6 from the CP2109 to supply the Transistor (Q47) in front of TXD optocopler. Also, you use this 5V to supply the BT-Modul. RX from the BT is to connect to Pin 5 from the FODM8061 (PC1) close to CP2109. TX is to connect to Pin 1 from Transistor Q47. Hi! I'm from Russia! I have a problem with my EOS 720i duo 3! I want to connect my laptop with charger by BT module! ErZett, i found in datasheet points for connection RX and TX my BT module, i connect BT by external pover supply 5V! I dont understand what what to do next??? In windows does it find it?